Harnessing innovative vision-based technology delivers an ingenious plant floor QC solution to manage deboning lines more efficiently and effectively. Innovative vision-based technology delivers an ingenious plant floor QC solution to manage deboning lines more efficiently and effectively. Gainco, Inc., a U.S.-based manufacturer of yield enhancement and yield tracking systems and equipment for poultry, meat and other food processing operations, announces the introduction of the YieldScan™ Rapid Frame Analyzer. YieldScan is a plant-floor QC solution to help manage poultry deboning operations more efficiently. It’s a powerful new instrument that provides more frequent and more useful information to improve the performance of manual and automated processing lines. Too often, poultry deboning lines do not perform up to par, with too much residual meat being left on the frame. YieldScan was designed to monitor actual performance in real-time to provide an analysis of the deboning process. By utilizing vision analysis of frames coming off of the processing line, the YieldScan provides information on where the residual meat is being left on a frame and the relative amount, thereby giving operators useful data that can be used to guide process improvements and address problems. 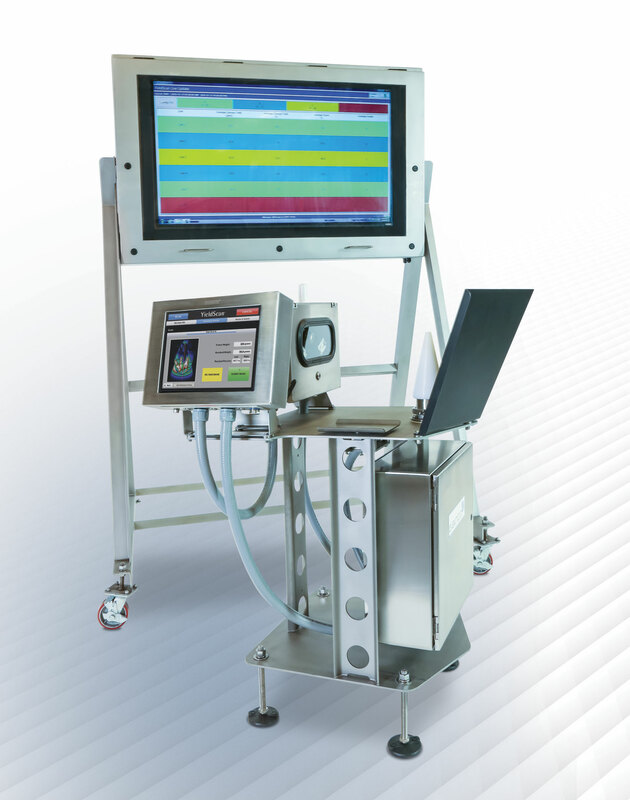 Designed with an optional large, enclosed monitor and stand for display in plain view of operators, the YieldScan Rapid Frame Analyzer also highlights the results as they are analyzed, giving workers instant feedback on their performance – and line supervisors the insights they need for immediate process optimization. Thanks to vision-based technology, as infrared light passes from the illuminated YieldScan cone through the meat, there is a direct relationship between the transmitted intensity (brightness) and the thickness of the meat. Within seconds, YieldScan calculates how much residual meat is left on the front-half of the frame. It also determines where the residual meat is located on the left versus the right side of the frame, providing trending data that can be used to troubleshoot performance problems and guide other deboning process improvements. YieldPlus delivers accurate, actionable data that benefit operators in numerous ways. It provides accurate evaluations based on many samples immediately, rather than “too few, too late” when utilizing scoring or manual QC methods. It contributes to noticeable improvement in the percentage of meat left on frames by focusing on actionable data for the plant. YieldScan also enables processors to perform effective, consistent evaluation of deboning processes from line to line and plant to plant by standardizing the method of analysis with a standard QC instrument. It provides the ability to comparatively evaluate workers on manual deboning teams, as well as react quickly to yield and product quality issues on automated deboning lines. With YieldScan, each frame observation takes only seconds. This means that a robust hourly sampling of 30 frames can be completed in less than five (5) minutes, giving processing managers a true picture of the deboning line’s performance. Frame size information, target value and other reference data are preloaded based on individual processing line characteristics, and all data is communicated wirelessly to internal services or onboard the instrument for intuitive, easy-to-use reporting capabilities. All equipment hardware is rugged and suitable for use on the plant floor, while an optional large monitor allows for easy-read display of data for operators working on a manual deboning line. Commenting on the introduction, Humberto Hernandez, product marketing manager stated, “YieldScan is an important new instrument that delivers more and better data on deboning line performance. It helps managers provide more effective oversight and employee coaching, leading to improved productivity and higher product yields. Highly innovative vision-based technology makes YieldScan not only noteworthy, but also a true industry breakthrough. Thanks to its unique capabilities and design attributes, a YieldScan Rapid Frame Analyzer installation will deliver improved efficiency and increased product yields. To learn more about this powerfully productive equipment or to request an in-plant demonstration, go to http://www.gainco.com/yieldscan or call 877-869-7410. Established in 1984, Gainco, Inc. provides engineered systems and solutions that improve product yields, quality and safety based on measuring, reporting and optimizing processing operations in the food industry. The company’s technologically advanced systems provide accurate, real-time data and insights that drive product quality, labor savings, and process line improvements. Gainco is a subsidiary of Bettcher Industries, Inc. Website address: http://www.gainco.com. The new YieldScan™ Rapid Frame Analyzer from Gainco - a powerful plant floor QC solution engineered to help manage poultry deboning lines more efficiently while significantly improving product yields.